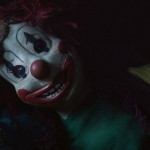 Yesterday, we got our first look at Poltergeist, director Gil Kenan‘s reboot for the 1982 film. Today, the first trailer for the upcoming movie has been released. Watch it here below, along with the first poster in the image gallery. 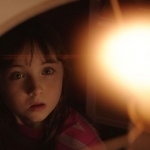 In the new film about a family whose home is possessed by spirits, Sam Rockwell and Rosemarie DeWitt play the parents of 8-year-old Madison Bowen (Kennedi Clements), with Jared Harris as the supernatural researcher and clairvoyant who helps the family. Jane Adams, Saxon Sharbino, Kyle Catlett, and Nicholas Braun also star. Like the original, television is a conduit from the spirit world. But in 2015, the screens are bigger, packing more menace. And there are screens throughout the house. The original film terrified me as a child, thanks to its scary clown and other ways the children in the movie were terrorized. It made me afraid clowns, TV static, and my house, as well as gave me an irrational fear of ancient Indian burial grounds. The new trailer shows that this remake is very close to the original, where once again, the children are at the center of the ghosts’ hostilities. I’m not sure how frightened today’s audiences are going to be of this new film, considering how many modern haunted house movies were inspired by the original Poltergeist. The new Poltergiest has Evil Dead creator on as producer, so that right there is reason enough to give this movie a shot. And speaking about being afraid of your home, Fox and MGM have created the viral site /www.diedinhouse.com, where you can enter the promo POLTERGEIST to find out if someone has died in your own house! You can also read real stories about homes where people died, including those that made the news. Lovely, right? 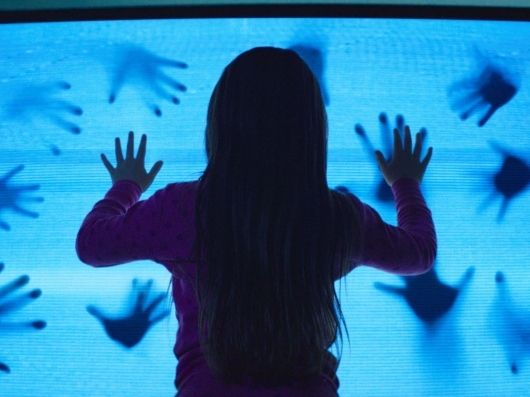 Poltergeist opens nationwide on July 24, 2015 in 3D. You’ll need QuickTime to view this official version embed of the trailer, so if it doesn’t play, click here to watch on YouTube or in HD over at iTunes.